50 - 140 kg WITHIN the standard! 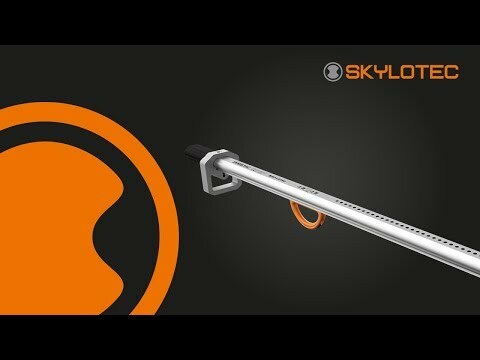 The popular SKYSAFE PRO, now also available in a length-adjustable version! Revolutionary, patented absorber system, which guarantees a max. impact of under 6 kN and a max. fall arrest distance of 1.75 m, even for a broad weight range of 50 - 140 kg. This makes SKYLOTEC the only manufacturer to fulfil the EN 355 standard with an increased test weight of 140 kg and it has also been tested for use on lifting platforms. Another feature of the absorber, the final impact resistance of 22 kN before AND after a fall is exceptional. The SKYSAFE PRO also meets the most relevant international standards in a SINGLE product. The SKYSAFE PRO adjustable version completes the SKYLOTEC range of I-web, Y-web, I-web tie-back, Y-web tie-back with a length-adjustable version, which always ensures the optimum distance for your work.